Grisedale Pike is one of the most shapely of the Lakeland fells, with a small pointed summit area supported by four ridges - three that come up from the valley bottoms and one that connects to Sand Hill and Hopegill Head. The three valley ridges form the fingers of a hand facing north-east, with two valley between them that belong entirely to Grisedale Pike bordering valleys that it shares with other fells. The fell is seen to good effect from the Whinlatter visitor centre, and especially from the balcony outside the cafe, from where the three northern ridges can be seen. The fell takes its name from Grisedale, the valley between the eastern and north-eastern ridges. This is one of the side-valleys that run off Whinlatter Pass (leaving opposite the visitor centre) and can be reached from the Revelin Moss car park. The southern flank of the fell forms the northern side of Coledale, and is a unbroken steep smooth grassy slope that runs for two miles from Braithwaite up to Force Crag, where it ends in a dramatic rock face that runs out from Grisedale Pike and blocks the end of the valley. The northern slopes of the fell spring out of Whinlatter Forest, and in particular Hobcarton Plantation in the west and Hospital Plantation in the east. There are plenty of forest tracks and footpaths within these forests, although they do make it a little harder to get a footing on the ridges from the north. The main route up Grisedale Pike from low ground is the path up the eastern ridge, Sleet How. This can be joined at Braithwaite, or by using forest trails starting at the Masmill car park (the car park east of the Whinlatter visitor centre. A path follows the un-named middle ridge between Grisedale Beck and Sanderson Gill, and does link up with the forest tracks. Our ascent of Grisedale Pike uses these two ridges. A path also leads up from Hobcarton End, the northern ridge, but I haven't tested this route. The summit can also be reached along the ridge from Sand Hill and Hopegill Head - most of the ridge walks in this area are a delight. Elsewhere the slopes are generally too steep for walkers, although Wainwright does have a route up from the Hobcarton valley. We have an ascent of Grisedale Pike from Masmill using the east route to ascent and the north-east route to descend. The summit of Grisedale Pike is a neat little ridge that runs from south-west to north-east, with the highest point at the eastern end where the three valley ridges join. It then slopes gently down to the south west, before dropping down to the ridge that connects to Sand Hill. Most of the named streams on Grisedale Pike run through their own valleys. The western boundary is formed by Hobcarton Gill. The northern boundary is formed by Whinlatter Gill flowing west and Comb Beck (Chapel Beck further downstream) flowing east. 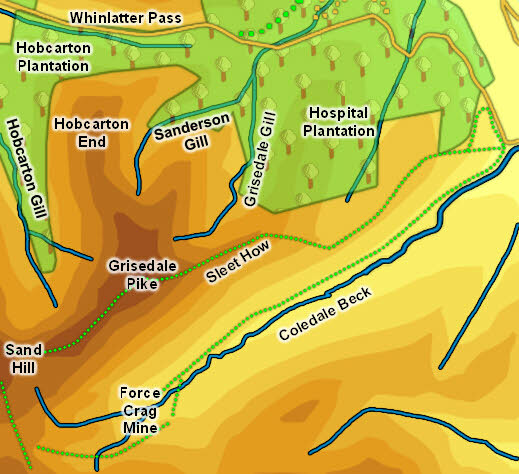 The main streams that are actually born on the fell are all found in the northern valleys - from west-to-east Sanderson Gill, Grisedale Gill and Masmill Beck. The southern boundary is formed entirely by Coledale Beck. The eastern boundary is less clear-cut, and is formed by a number of minor streams that eventually run into Newlands Beck. The fell can also claim a tiny footing on Newlands Beck itself between the points where Hallgarth Beck and Chapel Beck run into it. Grisedale Pike has no tarns.